Find information about MTender, developed by Quintagroup on the basis of the Prozorro code. 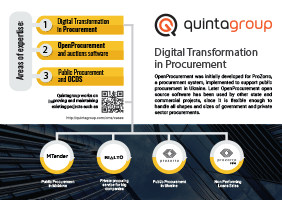 The eProcurement platform is built according to open data, open source and OCDS. Launched in January 2017, MTender was developed by Quintagroup on the basis of the Prozorro code and tailored to the Moldovan legislation. Quintagroup participated in full development life cycle of the system: from consulting services and defining business processes in BPMN notation to deploying the solution. As in Ukraine’s case, MTender was founded on three cornerstones: ‘everyone eyes everything’, the system’s code is open-sourced, and it is aimed at enhancing transparency and accountability of public procurement in Moldova. The eProcurement platform is built according to open data, open source and OCDS (Open Contracting Data Standard). It is built as a “low-cost, low-maintenance” hybrid multiplatform model, with a government-operated central database unit interconnected with independent eProcurement front-end platforms (commercial platforms). 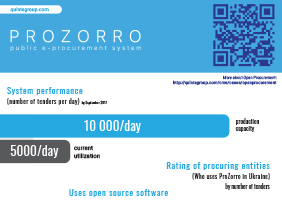 Concerning data format, Prozorro is reused in the infrastructure provided by MCloud, national cloud service that is to be used to host the system. The reason is that Prozorro was designed for hosting on Amazon Web Services; thus it implements S3 API. On the other hand, MCloud is using an API incompatible with S3. The MTender system consists of two main components: the front-end platforms (aka eMalls), and the central unit. Complaint Procedure is not realized in the pilot MTender and will be added to the system once the legislative framework for the complaint procedure is established. 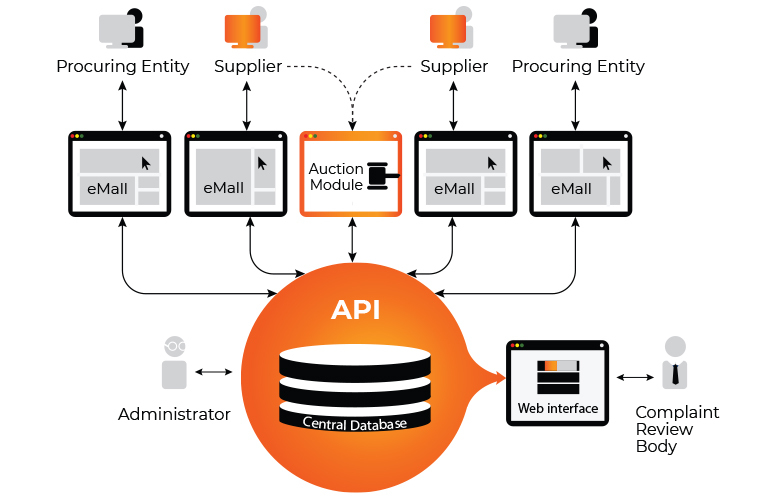 The front-end platforms interact with the CDB via the OpenProcurement API over a secure connection, and provide suppliers with temporary credentials to access the auction module hosted on the central unit. The central unit includes a central database (CDB), an API and several front-end systems (public portal, commercial platforms, reporting systems, risk management systems, analytics systems, controlling body systems, etc.) to provide or exchange information with a range of stakeholders. 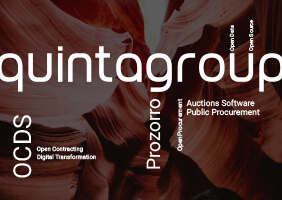 The central unit facilitates, along with the commercial platforms, the end-to-end execution of public procurement procedures, from ePlanning to eContract Management. The central unit data structure is based on Open Contracting Data Standards and follows the open data principle, publishing all data that can be published according to the law. The toolkit implementing the OpenProcurement API has been developed using powerful open source web technologies such as Python, Pyramid, AngularJS, Bootstrap, Flask, CouchDB, and PouchDB to ensure reliable functionality and secure workflow. A non-relational open source database, CouchDB, is used to store data about the auctions and the bids. Additional information, such as tender specifications and details of the offers from the bidders that are provided in binary files (pdf, word, excel, etc.) are stored on the file server.